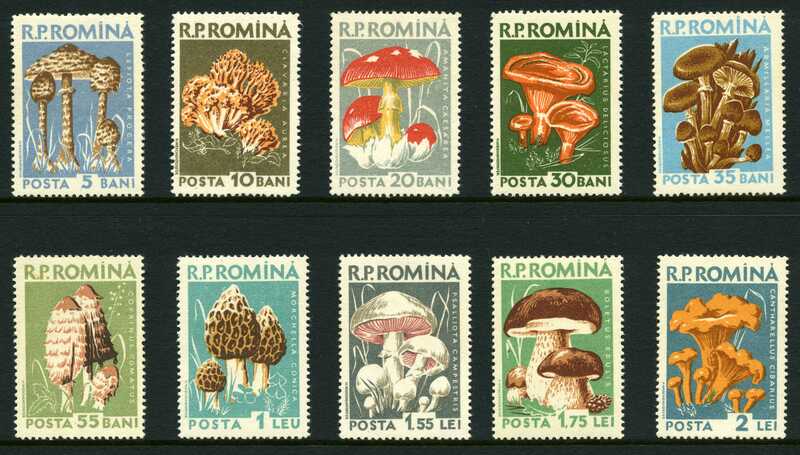 Fungi have appeared on many stamps issued from the 1950s onwards. According to Ing (1976) the first of these was ‘…the unusual Japanese issue of 1948’. Admittedly you need to be quite knowledgeable to appreciate the fungal connection of this issue. 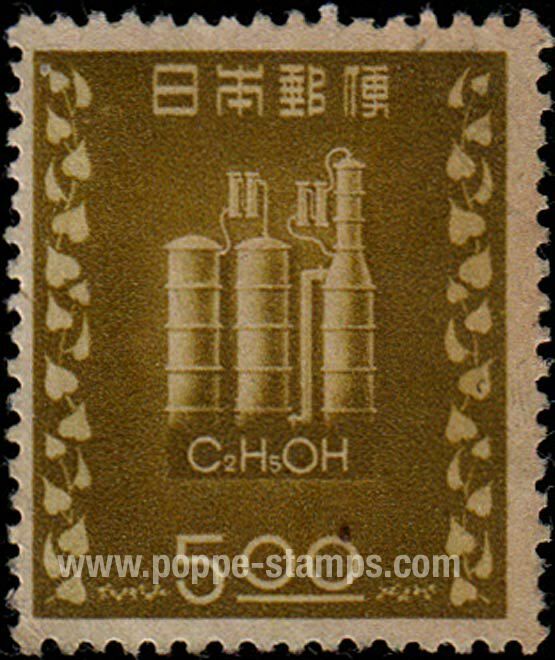 The stamp [SG483; VIEW] was issued to celebrate the 10th Anniversary of the Japanese Government's Alcohol Monopoly and it shows images of distillery towers, beneath which is inscribed 'C2H5OH' which is the chemical formula for ethanol. The fungal connection is that ethanol is produced by yeast fermentation. Ing (1976) further states that the first stamp issue to show images of fungi, and specifically portraits of mushrooms, was the set issued by Romania over the 12 to 30th July 1958 [VIEW], closely followed by the Czechoslovakian set issued on 6th October 1958 [VIEW], and the set issued by Poland on 8th May 1959 [VIEW]. 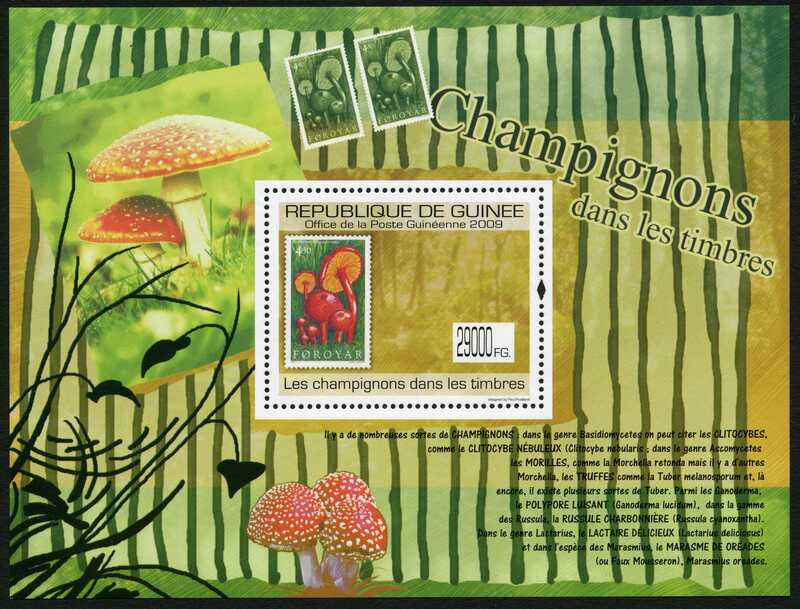 Since that time I estimate that more than 5000 stamps have been issued showing illustrations of fungi, mostly illustrations of mushrooms and similar macroscopic fungal fruit bodies. The majority of these are briefly catalogued and illustrated here. 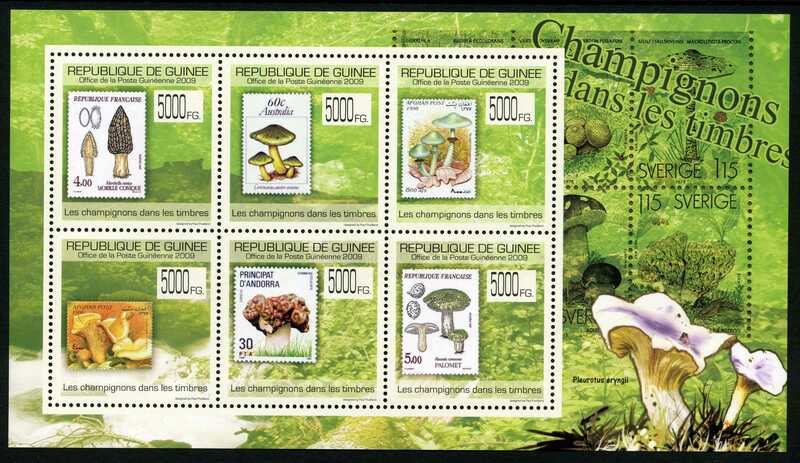 The stamp issue I like most is the gloriously self-indulgent Guinea 2009 series called 'Mushrooms on stamps', which features a collective sheet 175 x 98 mm [VIEW], of six 5000-Guinean franc stamps showing previous issues from Australia, Afghanistan, Andorra and France. 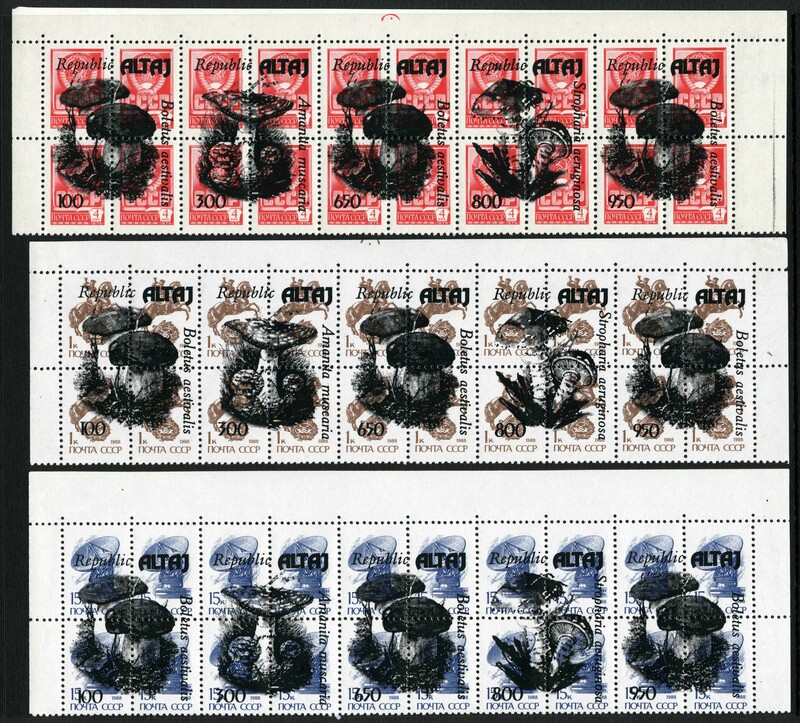 The set also includes a souvenir sheet, 142 x 107 mm with a single stamp of 29000-Guinean franc face value showing an issue from the Faroe Islands [VIEW]. In the following pages these stamps are listed in (alphabetical) order of the country or territory that issued them, the stamps of any one country being arranged in date order. In all cases you can download scanned images of the stamps in the form of JPG files at a good working resolution (600 dpi). Right-click on the file names to inspect the properties of these files to see their original physical size; you can then print to that size to reproduce the original stamp with fine detail. You can use these website pages to browse through the ‘collection’ to find items of interest to you. If you want to browse offline you can download a PDF file that lists the entire collection [it’s called StampWeb_full_list-2012; download it here]. Entries in this list show the country, year of issue, and where possible the Stanley Gibbons (SG) catalogue number. You can use that catalogue number to get more information about the stamp from the online catalogues at http://www.stanleygibbons.com. Stanley Gibbons Catalogue numbers for minisheets are also shown in StampWeb_full_list-2012 but with MS prefixes. Numbers with DM prefixes are uncatalogued items (the numbers show year of acquisition).The best way of conducting searches on the collection is to search the StampWeb_full_list-2012 PDF file using the ‘FIND’ function in your PDF-Reader to locate particular items in the PDF list and then use the country + date you extract from that to locate the item on the website to access the graphic(s). As an example of how you can use these data, I have searched <StampWeb_full_list-2012> for the species name ‘muscaria’ to test the proposition that Amanita muscaria (the Fly Agaric) must rate as the most frequently illustrated mushroomon stamps. Each line in the table that the ‘FIND’ function identified was cut and pasted into a Word-document to create Fly_AgaricLIST which, after tidying up, was saved as Fly_AgaricLIST.PDF [download it here]. Glancing through this list you will see that 77 countries issued images of the Fly Agaric from the very earliest (e.g. Czechoslovakia 1958 SG1061; [VIEW]) to the most recent (Republic of the Congo 2012 sheet [VIEW]). 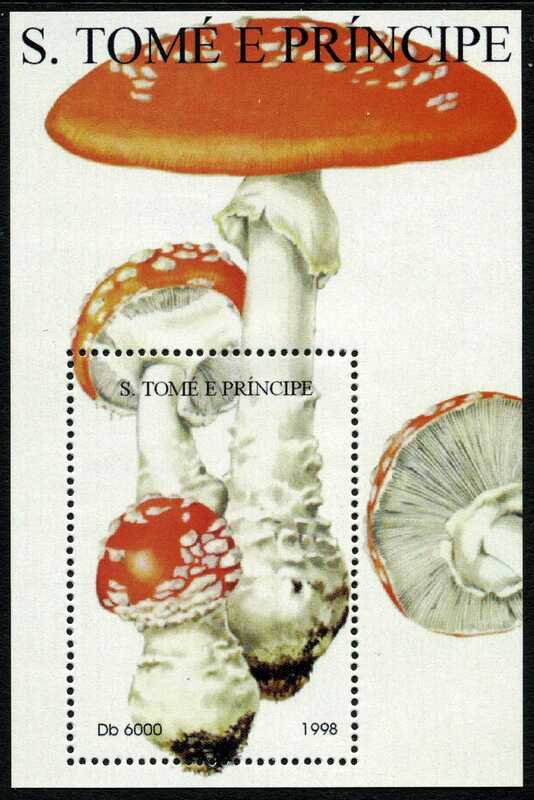 The quality of the images vary from the poorly-printed sketch (Russian Federation Altai 1996, blocks of old Soviet stamps overprinted [VIEW]) to some very fine illustrations of Fly Agaric issued by St Thomas & Prince Islands in 1998 [VIEW]. 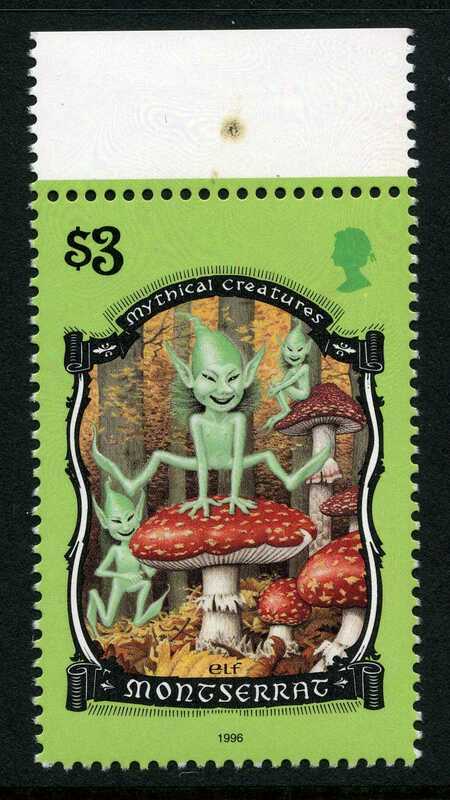 There are at least 130 postal items represented here; though the exact number depends on whether your definition includes the background images of minisheets and souvenir sheets, covers of stamp booklets and, also whether, as well as realistic portraits of the mushroom, you are willing to include more fanciful illustrations such as those including elves and fairies (e.g. Montserrat 1996 [VIEW]) or frankly cartoon images (e.g. Czech Republic 2002 booklet cover [VIEW]). 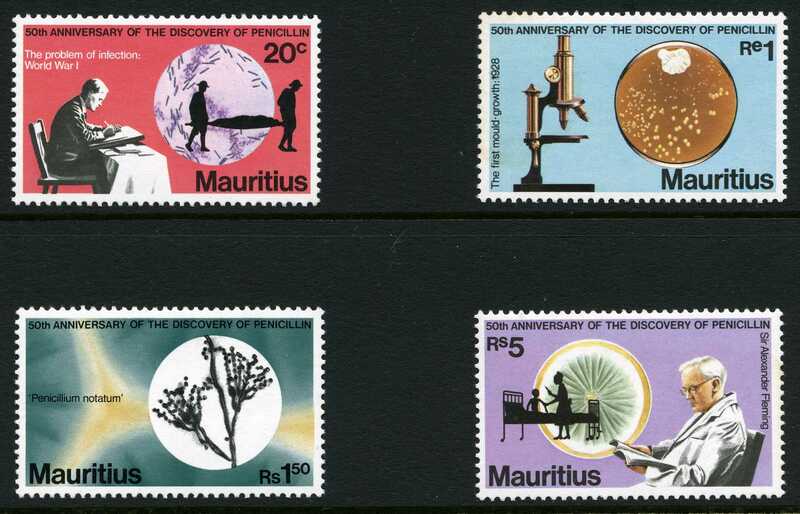 When it comes to mycologists - the scientists who study fungi - a stamp set commemorating the discoverer of penicillin (Sir Alexander Fleming) were issued by Mauritius in 1978 [VIEW] and similar commemoratives have also been issued by several African countries since that date, such as St Thomas & Prince Islands 2003 [VIEW] and 2007 [VIEW], Guinea 2002 [VIEW], though I’m not convinced that the two portraits shown in the Mozambique 2002 Minisheet MS1665, one clean shaven and one bearded [VIEW], really are both of Alexander Fleming! This frequent commemoration of Fleming is right and proper, given the colossal difference that antibiotics made to the health of humanity, but Fleming was a bacteriologist, and the usual story is that the fungus drifted into his attention in a temporarily deserted laboratory. 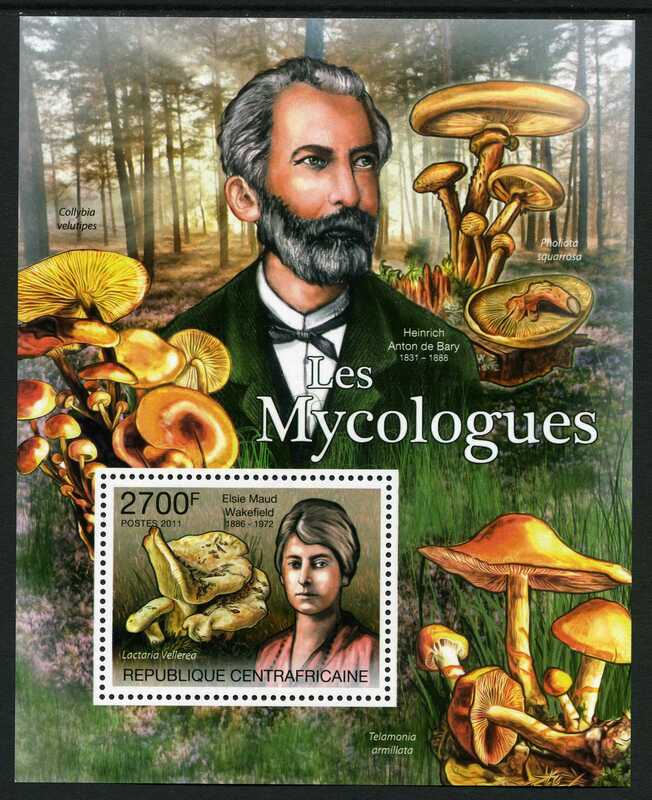 Some of those who have spent their lives studying fungi have been commemorated in issues from Central African Republic 2011. These included William A. Murrill (an American mycologist known for his contributions to knowledge of agarics and polypores); Fred J. Seaver (an American expert on discomycetes); and A.H.R. Buller, an Englishman who worked at the University of Manitoba and was a renowned experimental mycologist and plant pathologist [VIEW] together with a souvenir sheet with a stamp showing a portrait of Elsie Maud Wakefield (an English mycologist and plant pathologist at the Royal Botanic Gardens, Kew) while the sheet displays a portrait of Anton De Bary (considered to be a founding father of modern mycology and plant pathology) [VIEW]. 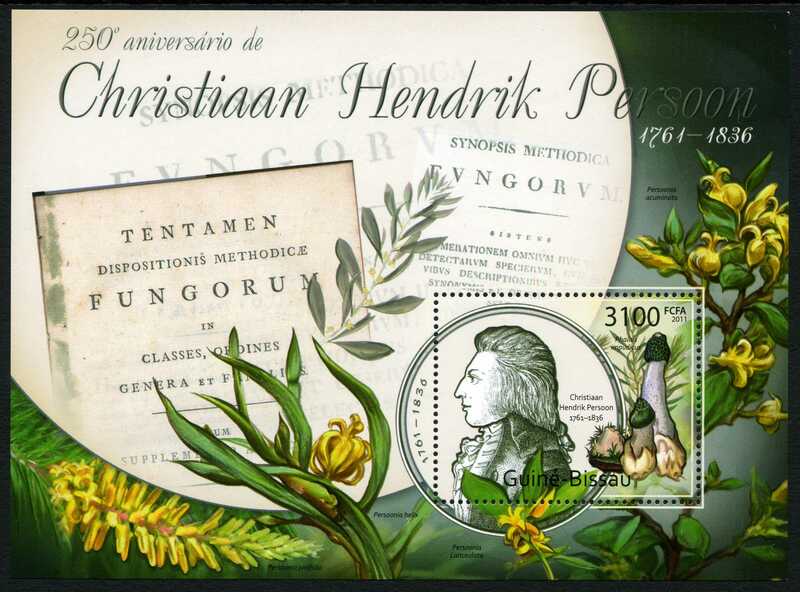 Another founding father of mycology, Christiaan Hendrik Persoon, is commemorated in a handsome souvenir sheet issued by Guinea-Bissau 2011 that bears a single stamp with a portrait of Persoon, while the sheet background shows title pages of some of his books and is decorated with sprigs of the Australian trees and shrubs of the genus Persoonia that was named after him [VIEW]. 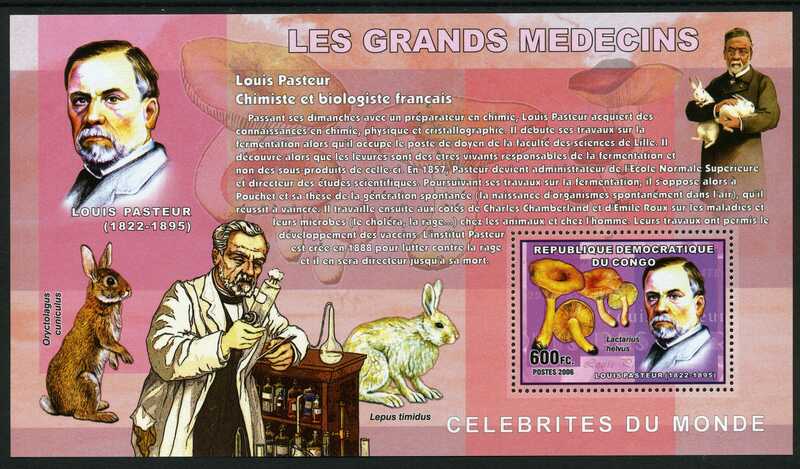 A portrait and brief biography of Louis Pasteur appears on a souvenir sheet issued by the Democratic Republic of the Congo 2006 [VIEW]; the same country having issued three stamps commemorating three Chemistry Nobel Prize-winners, each featuring a different (unidentified) fungus (Congo, Democratic Republic (Kinshasa) 2002; [VIEW]). Now why don't you browse through this Fungi on Stamps Web and look for other items of interest? These references include Internet URLs or DOI URLs. The acronym DOI stands for Digital Object Identifier, which uniquely identifies where an electronic document (or other electronic object) can be found on the Internet and remains fixed. Other information about a document may change over time, including where to find it, but its DOI name will not change and will always direct you to the original electronic document. To access one of these references enter the DOI URL into your browser (double-click on the blue hyperlink) and you will be taken to the document on the website of the original publisher. If your institution maintains a subscription to the products of that publisher you may be able to download the complete text of the article; otherwise you will have to pay a fee for the download. Save the downloaded document to your hard disk to build your own reprint collection. Aggersberg, D.J. (1991). Collect Fungi on Stamps (A Stanley Gibbons Thematic Catalogue). Published by Stanley Gibbons [Paperback: 48 pages] ISBN-10: 0852592930, ISBN-13: 978-0852592939. Coetzee, J.C. (1993). Yet more fungi on stamps. Mycologist, Volume 7, Issue 1, February 1993, 29-31. DOI: http://dx.doi.org/10.1016/S0269-915X(09)80624-1. Greenewich, J.P. (1997). 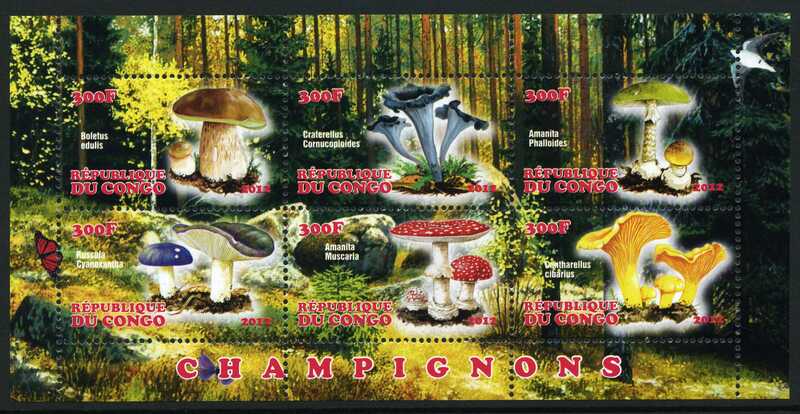 Collect Fungi on Stamps, 2nd edition (Stamp Catalogue). Published by Stanley Gibbons [Paperback: 96 pages] ISBN-10: 0852592930, ISBN-13: 978-0852592939. Hudson, H.J. (1994). Leaf blotch of horsechestnut on a stamp. Mycologist, Volume 8, Issue 2, May 1994, Page 85. DOI: http://dx.doi.org/10.1016/S0269-915X(09)80136-5. Ing, B. (1976). Fungi on stamps. Bulletin of the British Mycological Society, Volume 10, Issue 1, Spring 1976, 32-37. DOI: http://dx.doi.org/10.1016/S0007-1528(76)80020-X. McKenzie, E.H.C. (1995). Leaf spot of Pua on a stamp. Mycologist, Volume 9, Issue 2, May 1995, Page 81. DOI: http://dx.doi.org/10.1016/S0269-915X(09)80217-6. Molitoris. H.P. (with Kahl, R. & Kuthan, J.) (1990). Fungi on stamps. [Exhibition Contribution EH-4 to the International Mycological Congress, 28th August-3rd September, 1990]. Published by the University of Regensburg Library (Zentralbibliothek). Regensburg, Germany. 48 pages. Moss, M.O. (1992). 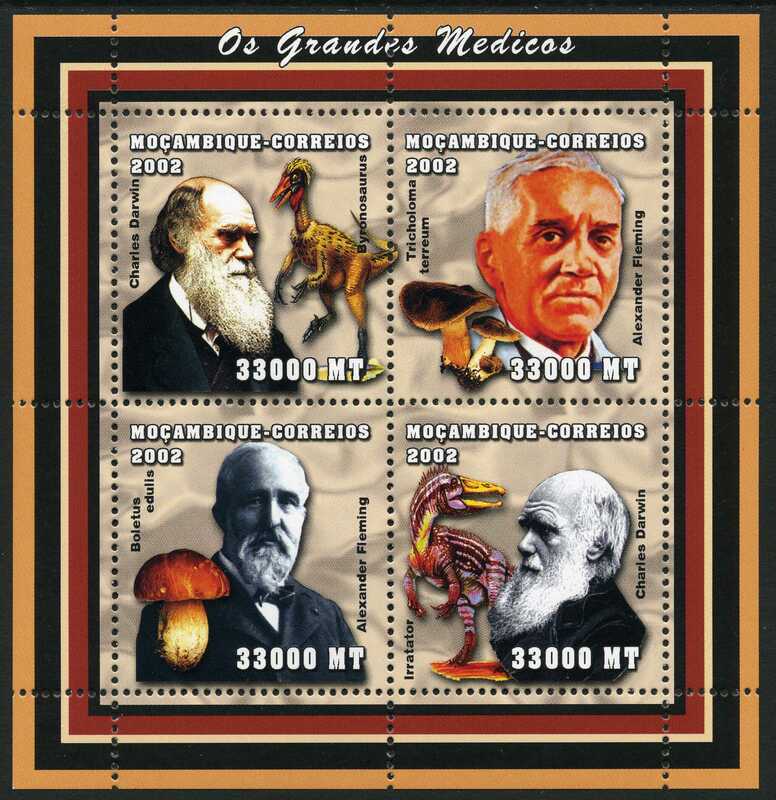 A selection of microfungi depicted on postage stamps. Mycologist, Volume 6, Issue 2, May 1992, 68-71. DOI: http://dx.doi.org/10.1016/S0269-915X(09)80452-7. Moss, M.O. (1993). The Doris Rast fungal stamp collection. Mycologist, Volume 7, Issue 1, February 1993, Page 28. DOI: http://dx.doi.org/10.1016/S0269-915X(09)80623-X. Moss, M.O. (1996). Recent issues of stamps about fungi from Jersey and the Isle of Man. Mycologist, Volume 10, Issue 3, August 1996, 111-112. DOI: http://dx.doi.org/10.1016/S0269-915X(96)80071-1. Moss, M.O. (1998). Gasteroid basidiomycetes on postage stamps. Mycologist, Volume 12, Issue 3, August 1998, 104-106. DOI: http://dx.doi.org/10.1016/S0269-915X(98)80005-0. Moss, M.O. (2001). Fungal stamps from Liechtenstein. Mycologist, Volume 15, Issue 4, November 2001, Page 178. DOI: http://dx.doi.org/10.1016/S0269-915X(01)80016-1. Moss, M.O. (2001). Microsporium canis on a stamp. Mycologist, Volume 15, Issue 4, November 2001, Page 177. DOI: http://dx.doi.org/10.1016/S0269-915X(01)80015-X. Moss, M.O. & Dunkley I.P., (1981). More fungi on stamps. Bulletin of the British Mycological Society, Volume 15, Issue 1, April 1981, 61-63. DOI: http://dx.doi.org/10.1016/S0007-1528(81)80037-5. Moss, M.O. & Dunkley I.P., (1984). Fungi on stamps 1980–1984. Bulletin of the British Mycological Society, Volume 18, Issue 2, October 1984, 134-138. DOI: http://dx.doi.org/10.1016/S0007-1528(84)80036-X. Moss, M.O. & Dunkley I.P., (1986). 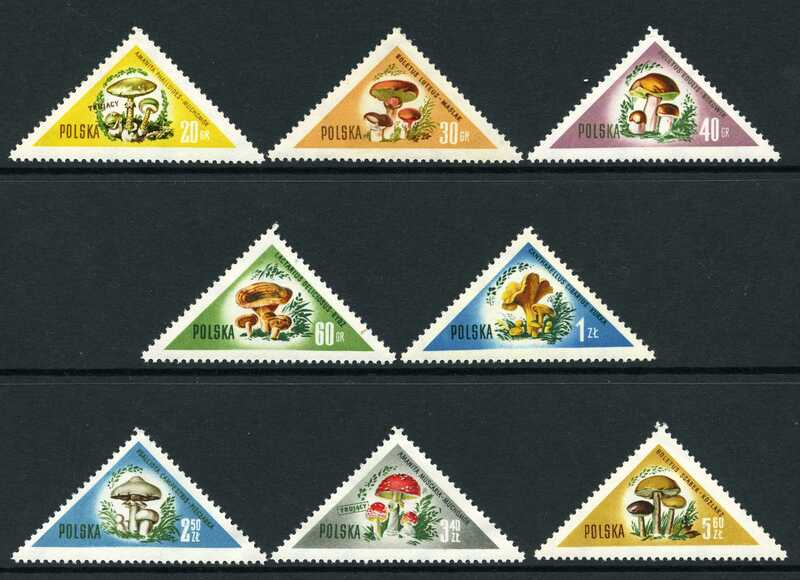 Fungi on stamps 1984-1985. Bulletin of the British Mycological Society, Volume 20, Issue 1, April 1986, 63-68. DOI: http://dx.doi.org/10.1016/S0007-1528(86)80020-7. Moss, M.O. & Dunkley I.P., (1988). 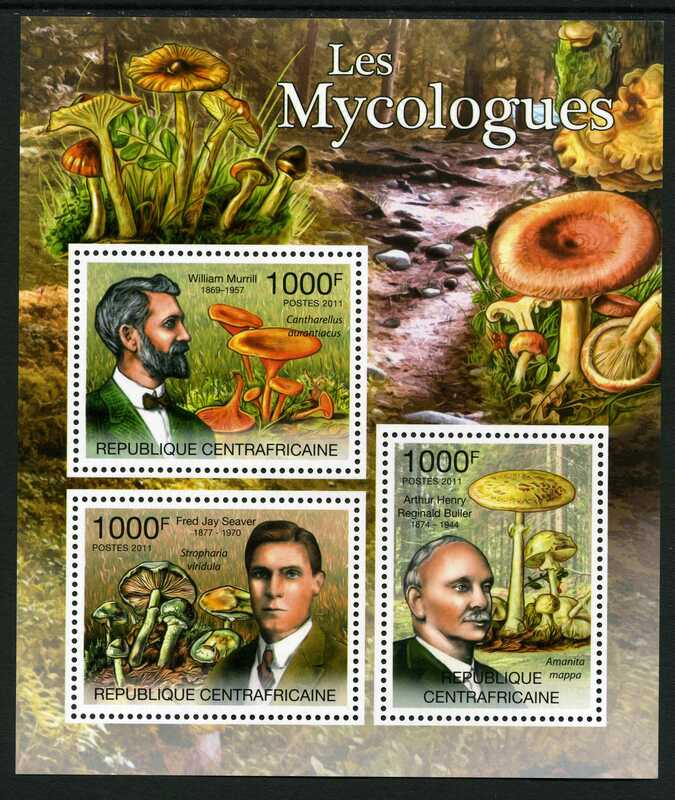 Recent issues of postage stamps depicting fungi. Mycologist, Volume 2, Issue 3, July 1988, 116-121. DOI: http://dx.doi.org/10.1016/S0269-915X(88)80078-8. Moss, M.O. & Pegler, D.N. (2003). Recent stamp issues of fungi from New Zealand. Mycologist, Volume 17, Issue 4, November 2003, 176-178. DOI: http://dx.doi.org/10.1017/S0269915X04004094.